386 pages | 55 B/W Illus. In this book, contributors have been brought together to discuss the role of two major factors shaping the grammars of different varieties of English (and of other languages) all over the world: so-called vernacular universals and contact-induced change. 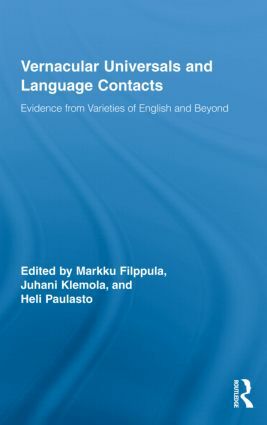 Rather than assuming a general typological perspective, the studies in this volume focus on putative universal vernacular features – significant phonological or (morpho-) syntactic parallels found in non-standard varieties of English, English-based Creoles, and also varieties of other languages, all of which represent widely differing sociolinguistic and historical backgrounds. These universals are then set against the other major explanatory factor: contact-induced change, by which we understand both the possibility of dialect contact (or dialect diffusion) and language contact (including superstratal, substratal and adstratal influences). Markku Filppula is Professor of English at the University of Joensuu and a member of the Finnish Academy of Science and Letters. He is the author of The Grammar of Irish English: Language in Hibernian Style (1999), co-author of English and Celtic in Contact (2008), co-editor of The Celtic Roots of English (2002) and Dialects Across Borders (2005). Juhani Klemola is Professor of English at the University of Tampere. He was awarded his PhD by the University of Essex in 1996. He is co-author of English and Celtic in Contact (2008), co-editor of Speech Past and Present: Studies in English Dialectology in Memory of Ossi Ihalainen (1996), The Celtic Roots of English (2002), Dialects Across Borders (2005), and Types of Variation (2006). Heli Paulasto is Researcher in English Language at the University of Joensuu, where she was awarded her PhD in 2006. She is author of Welsh English Syntax: Contact and Variation (2006), co-author of English and Celtic in Contact (2008), and co-editor of The Celtic Roots of English (2002). The Germanic languages are among the best described in the world and exhibit a considerable degree of variation. Yet, with the exception of English, their properties and structural variance have yet to be fully exploited for linguistic theory. The purpose of this series is to promote more intense interaction of general linguistics with the field of Germanic linguistics as a whole.